When talking about fish species, most people use the common name, such as leaf fish or lemon tetra. However, the scientific name is much more precise because common names can refer to more than one species. Here, then, are some common fish names starting with "L," along with their scientific classification. Synodontis nigrita. This Synodontis breed grows up to 7 inches and eats pretty much anything, including some common vegetables, like shelled peas and cucumbers. Watch out for name confusion: Synodontis nigrita may be mislabeled as upside down catfish (Synodontis nigriventris), which grows larger than an S. nigrita. Melanotaenia herbertaxelrodi. Native to Lake Tebera in Papua New Guinea, this peaceful fish shows its colors best in heavily planted, slow-flowing water. It also does best in high-quality water, requiring weekly (partial) water changes. Males are larger, have a deeper belly and are more brightly colored than females. Ictiobus cyprinellus. This freshwater "sucker" fish is native to North America, including many regions of the U.S. and in Canada from Manitoba to Saskatchewan. It grows up to 25 inches and is distinguishable from smallmouth buffalo by its terminal mouth and its relatively low-profile back; Smallmouth have a subterminal mount and an arched back. Monocirrhus polyacanthus. The leaf fish, or Amazon leaf fish, is found in the Amazon River Basin and is known for its convincing portrayal of a leaf floating downstream. This camouflage helps it evade predators and sneak up on prey. Once a shrimp or other prey is within reach, the leaf fish grabs it by extending its jaws in an explosive action. Hyphessobrycon pulchripinnis. 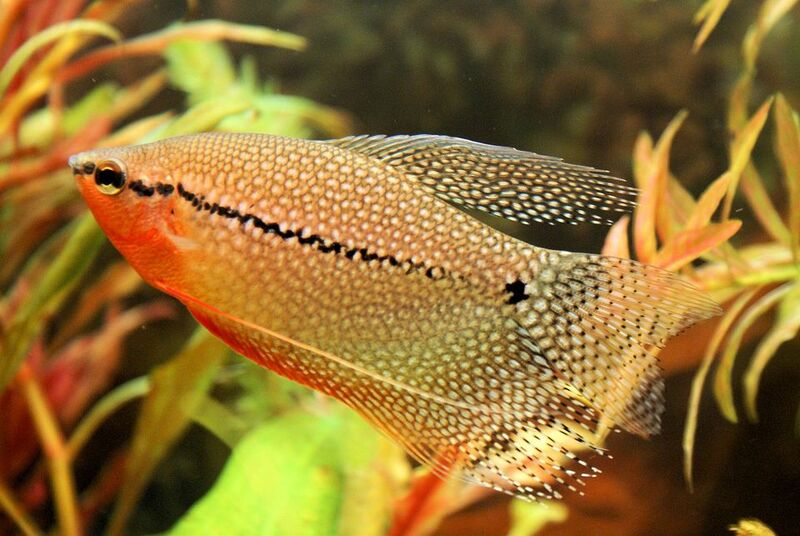 This peaceful native of South America is a popular fish for beginner aquarists, due to its beauty and relatively hardy composition. It has a translucent body and a bright yellow streak along its lower fin. Acantopsis dialuzona. Found throughout much of Southeast Asia, this loach likes to bury itself in the sand so that only its eyes are exposed. It must have very clean water, requiring weekly tank changes of 30 percent to 50 percent. Lepisosteus osseus. A large prehistoric fish, the longnose gar has a torpedo-shaped body and a long, pointy snout filled with sharp teeth. It can grow up to 6 1/2 feet. Found in much of the eastern half of the U.S. and in the St. Lawrence River up to Quebec, Canada, it is sometimes fished for sport but more often blamed for preying on other sport fish. Leopard Danio - Brachydanio rerio "frankei"